James Mott and Mike Gorman have been playing together as Second Sufis since 1986. This is their sixth album of improvised, real time music. 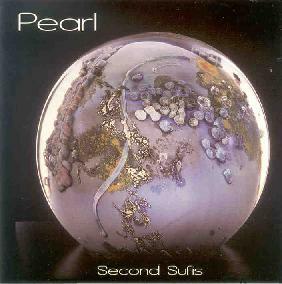 Pearl is like a journey through a hidden world of vanished sounds and primeval landscapes. In the tradition of artists like Jon Hassell and Tuu, the distant past meets up with the current era and beyond as ancient instruments like udus, dhumbeks, tablas, acoustic guitars, a Bronze Age Irish horn, didgeridoo, Tibetan singing bowls and a Chinese bowl gong mesh effortlessly with modern synthesizers, electronic drums, Chapman stick, and electric guitar, not to mention real time sample looping and sequencing. From the completely percussive Dusty Road, which starts the trip, to the refreshing acoustic guitars of Rain, there is plenty of variety on the album. But the pieces that really stood out for me were the longer ones, like the 10-minute Guernica, with its humming horns, sighing gongs, leisurely rhythms and intense, Frippoid guitar; and of course, the epic title track: a deep, slowly building, 26-minute long electric and acoustic jam that takes you far, far away indeed. Lush, mysterious, and enchanting, I enjoyed every exotic moment of this CD. Contact via snail mail c/o Second Sufis; 104 W. Hyerdale Dr; Goshen, CT 06756.